An elephant makes its way close to the fence to eye the participants on the Honolulu Zoo's weekly "Twilight Tour," popular with animal-lovers of all ages. The ruckus doesn't stop at night at the Honolulu Zoo. After the sun goes down and the last human visitors leave, the lions still roar, monkeys howl and birds chatter, breaking the serenity of dusk hours. 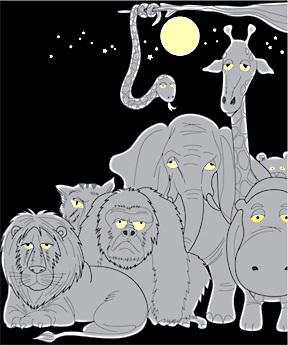 A weekly tour aims to show animal-lovers just what the zoo creatures are up to at night. "It's just us and the animals," said Dolly Drum, tour leader. "They like to talk at this hour." The two-hour walking tour provides such trivia as how white-headed gibbons are able to catch a bird in mid-air for a snack, and how Rusti the orangutan can climb to the top of his exhibit in the blink of an eye. We carried flashlights covered with red cellophane and were instructed to keep our own noise level down to avoid disturbing the animals. We visited a variety of exhibits, from the flamingos -- where we learned a bit about their color, ecosystem and egg-laying habits -- to the hyenas, where we got an up-close view of the critters. This was a treat because they are nocturnal, so day visitors can only catch them snoozing. "The hyenas got a bad rap on 'The Lion King,' but they are one of the most important animals on the savanna. They are the clean-up crew," Drum explains. "They eat everything that nobody else wants. ... They are the trash compactors and the recyclers." Drum also mentioned that the Greeks viewed the hyena as a symbol of homosexuality, because their male and female reproductive organs look the same. Moreover, she said, hyenas don't laugh. "But they do make 27 different vocalizations. Because they can make so many different sounds, people mistake it for laughing." 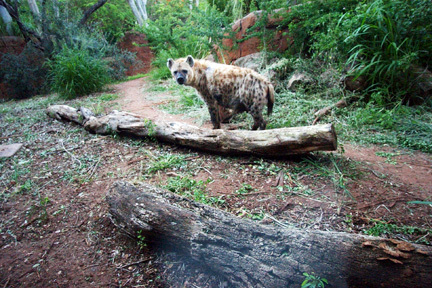 The "Twilight Tour" catches a hyena awake. The animals normally sleep during the day. JUST BECAUSE THE animals are in cages, the close-up nature of the tour allows some to feel a jungle vibe. "I'm scared," said 5-year-old Joey Lau as he left the hyena exhibit to come face to face with the lions. The excursion is popular with animal-lovers of all ages, so adults outnumbered the children. Susan Crawford, of San Jose, took the tour with her kids, Tyler, 11, and Stacy, 18. 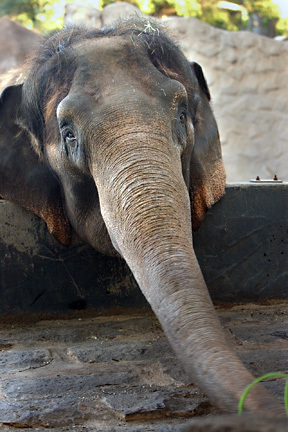 "Every time we come to Hawaii we visit the zoo, but have never went at night," Susan said, adding that the animals seemed as interested in the tour group as vice-versa. "It was awesome," said Tyler. "I liked the orangutan. He looked like he was smiling at us!" Tour guides assisted in luring the animals out for a peek by feeding them hay or apples and treats. The hippos came out to eat their apples, drawing a lot of "ooohs" and "aaahs" from the crowd. "The hippos really like people," said Drum, who explained that in spite of their sluggish appearance, the creatures are dangerous in the wild and should not be underestimated. "Hippos can run at least 30 mph," she said, adding that they are responsible for more human deaths than lions or other animals. And while there are "bird people" and "dog people," many find there's always room in their hearts to adopt another favorite animal. Ten-year-old Max Gardner said his favorite creatures are amphibians and reptiles. But on the tour, he got the most enjoyment out of his visit to the tiger's den. "My mom and I have three pet cats," he explained. "I really like cats."